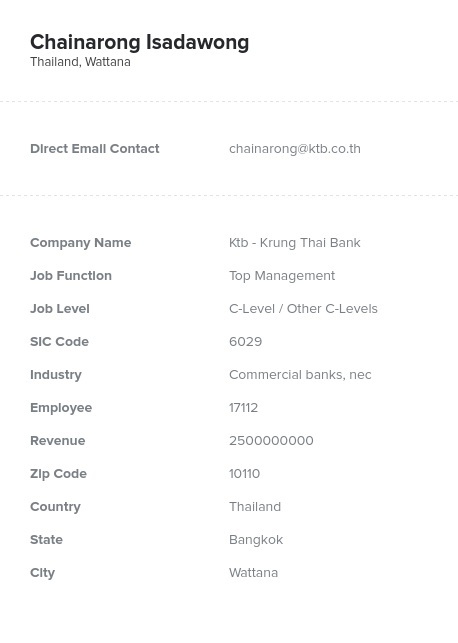 Buy this email list and add Thailand to the map of places where you do business. Our B2B email lists are checked for accuracy by both computers and real people. We offer reliable targeted email lists to individuals who want their business to reach the next level! At Bookyourdata.com, we take all of the work out of connecting with Thai businesses that could use your products. Our email marketing lists provide you with the data you need to reach across the globe to make B2B connections. In addition to names, this Thailand mailing list provides you with direct email addresses, phone numbers, and postal addresses. Our ready-made business contact lists are a fast, simple option to get the sales leads you need. In this pre-built Thailand email list, you'll find a diverse collection of valuable information. You also have the option of customizing a list so you can decide on the job function or job level of the people you connect with. Plus, customization gives you the opportunity to specify the size of the companies on your email address list as well as the amount of revenue they take in. Customizing a business mailing list takes just minutes but gives you the exact information you're looking for. Both types of lists give you an advantage when it comes to tracking down sales leads. One of the best things about our bulk email lists is that you can start making connections right away. When time is of the essence, this Thailand email database can give you a head start on the competition!